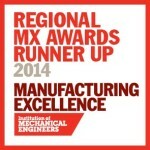 The winners of the first ever Regional MX Awards in the Midlands and Yorkshire/the North East regions have been announced at high profile ceremonies. The Awards gave companies from across the regions the chance to be the first to take advantage of the online assessment tool to benchmark their business. It also gave finalists the chance to showcase their exceptional products, processes and business practice to their regional peers. Airedale Springs Ltd was one of three Companies shortlisted for the Yorkshire/ North East Regional MX Awards and has been awarded runner-up at a ceremony at the Cutlers Hall in Sheffield.